Custom Connectors increase your experience when using Diagrams by enabling you to define custom connector points around the shapes. Four (Left, Right, Top, Bottom) connectors located in the middle of the four sides of the shape's bounding rectangle. A central connector (aka auto-connector) which acts as an auto-switch. If you connect to this one the framework will choose automatically between the standard four connectors with logic based on shortest paths between shapes. Besides these connectors you can define custom connectors or remove the existing connectors. The internal logic of the auto-connector depends on the four additional connectors, if you remove one or more of these connectors it will lead to issues if attaching to the auto-connector. Best practice is to either leave the five connectors (besides your own custom connectors) or remove all of them at the same time. Please note that setting the name of the connector is almost mandatory if you are going to use it later in your application. (0,0) corresponds to the upper-left corner of the shape. (.5,.5) corresponds to the center of the shape. (1,1) corresponds to the bottom-right of the shape. The bounds of the shape do not take the connectors into account. If you put a connector at an Offset of (23,55) for instance the shape's width will not be scaled to 23 times the actual shape's width. This also means that when using a graph layout the layout will organize shapes with respect to the actual or visual bounds. 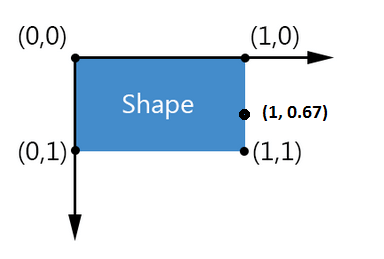 The visual interpretation of a connector put at a large Offset might lead to confusion since it potentially can be interpreted as the connector of another shape. In addition, if a connection is bound to a connector far off its parent shape it might be interpreted as a floating connection. So, in practice you can go outside the actual bounds of the shape but some moderation is advised. .Offset = New Point(1, 0.25),  .Name = x.Name.ToString() & "Connector1"
.Offset = New Point(1, 0.75),   .Name = x.Name.ToString() & "Connector2"
.Offset = New Point(0, 0.25),  .Name = x.Name.ToString() & "Connector3"
.Offset = New Point(0, 0.75),  .Name = x.Name.ToString() & "Connector4"
Next step is to add some connections between the custom connectors. The first four connections below are created with the RadDiagram.AddConnection() method with the overload that takes 2 shapes and 2 custom connectors given by their names. The next four connections are attached with the RadDiagramConnection.Attach() method which takes two connectors. You can download a runnable project of the demonstrated example from our online SDK repository here, after navigating to Diagram/CustomConnectors. Note that the Connectors are made visible on selection or when ConnectorTool is active. When you are defining a custom shape you can control the visibility of the Connectors by disabling the ConnectorsAdornerVisible VisualState. You can find the ConnectorsAdornerVisible VisualState in the ControlTemplate of the RadDigramShape.